Dave Petitjean Jr. was born in Rayne, Louisiana in 1928 His parents were Dave Sr. and Mary Petitean, who ran a warehouse that stored crops for local farmers. 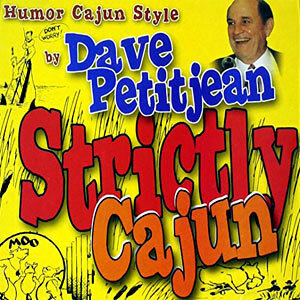 Influenced by Louisiana humorists Bud Fletcher and Justin Wilson, Petitjean, with his Acadian ancestry, found he could mimic the Cajun dialect and started telling jokes after sales meetings. He went on to record his first album at a Houston nightclub in 1961. Living in Crowley, LA, he and his wife, Audrey, have been married since 1950 and have two sons. 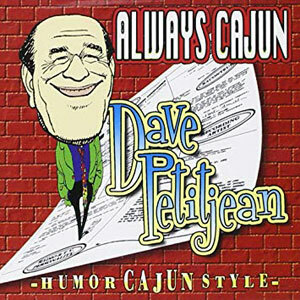 With the phrase, “A smile is contagious, so be a carrier,” Petitjean publishes the newsletter “Cajun Recipe for Humor” on the Internet at www.cajunlaff.com. He briefly attended Louisiana State University at age 16, but left the school to join the Navy and was assigned to the USS Estes, flagship for the 7th Fleet. As the ship’s disbusing storekeeper, he was stationed in Tsingtao, China, for his entire naval career. After the war, he studied agriculture at Southwest Louisiana Institute (now the University of Louisiana at Lafayette). He graduated and joined Olin Chemical Co. around 1950, from which he retired after some 25 years. He then joined Farm Bureau Insurance and retired in 2000. He credits Bill Gove with teaching him how to organize routines and develop motivational messages through humor. 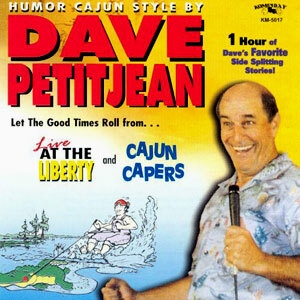 There are thousands of good humorists in the U.S., but only a handful of Cajun humorists. Dave is undoubtedly among the best humorists of any kind, as his style is a unique blend of love and laughter, suitable for all audiences, young or old! Mr. Petitjean passed away June 18, 2013.